Many college swimmers are getting ready for mid-season taper meets, which means the times on the scoreboard are getting faster in this second week of November. Here’s a rundown of the swimmers and divers honored by their conferences as the athletes of the week. Bomprezzi, a senior from Scottsdale, Ariz., finished first in the 500-yd freestyle (4:37.51) and the 1,000-yd freestyle (9:30.95) in a dual meet against Brown this past weekend. Bomprezzi also finished second in the 200-yd freestyle with a time of 1:43.24. Werenski, a sophomore from South Hadley, Mass., won a pair of individual races (200-yd breaststroke and 200-yd individual medley) with times of 2:22.38 and 2:06.43, respectively, while finishing second in the 100-yd breaststroke (1:07.19). Werenski improved her season record to 10-1 in individual races. Wyeth, a freshman from Wellington, New Zealand, finished first in 100-yd backstroke (50.12) and the 200-yd backstroke (1:51.58) this past weekend. Wyeth also swam the third leg of the winning 400-yd freestyle relay and the first leg of the 200-yd medley relay team that finished second. Lane, a freshman from Vinton, Va., won both the 200-yd freestyle (1:54.75) and the 500-yd freestyle (5:06.20) against William & Mary this past weekend. Lane’s time in the 500 free was nearly three seconds faster than the second-place swimmer in that event. Knight continued to show off his dominance in the fly races while helping the Seminole relays to four season best times. In the 200 fly, Knight recorded an NCAA B-cut, turning in a season best time of 1:45.04. The senior’s time is the fifth best mark in the country this season and the second fastest in the ACC. In the second portion of the meet, Knight clocked a 47.23 in the 100 fly, marking the fastest swim in the NCAA this season in the event. Kylliainen had a strong showing against the Tar Heels. The senior finished the meet with NCAA B-cut times in four different races. In the first event of day two, Kylliainen swam a 25.71 split as a member of the 200-medley relay team which edged their Tar Heel counterparts by 0.84 seconds. The Towson, Maryland, native won the 200 IM with an NCAA B-cut time of 1:58.48 and the 200-fly with another B-cut time of 1:56.37. Kylliainen also won the women’s 100 backstroke with an NCAA B-cut time of 54.29 and dominated the 400 IM with a B-cut time of 4:14.04. Nyquist took home the ACC Male Diver of the Week after he swept the diving events in the Tar Heels dual meet against Louisville. 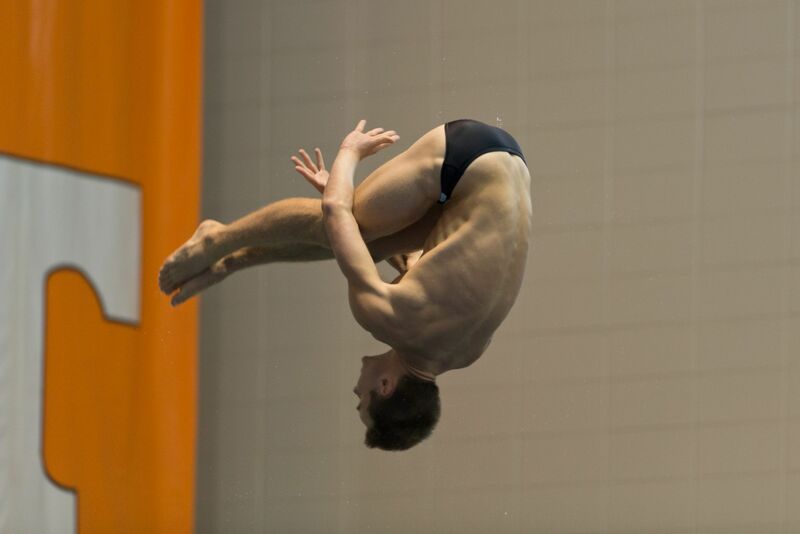 The Alpharetta, Georgia, native edged out teammate Sean Burston in the 1-meter diving, prevailing by 1.43 points. In the 3-meter competition, Nyquist was dominant as he scored 423.82 points, a score nearly 59 points ahead of second-place Sean Piner of Louisville. His 3-meter score was the highest of the season and just shy of his collegiate career-best of 436.58 set against Texas as a freshman. Dawson was named ACC Female Diver of the Week after winning both diving events to help lead the Tar Heels edge the Cardinals. Dawson won the 1-meter with a season-high score of 323.48, nearly 27 points ahead of second place. On the 3-meter board, Dawson set a new school record score of 384.08, breaking her own record score of 355.13 set earlier this year against Georgia. The freshman has won five of eight events to date in North Carolina’s four dual meets. Fleagle had a tough triple in the dual meet against Princeton, winning the 50, 100 and 200 freestyles. He also stepped up for relay duty, participating in all three victories in the 200 medley relay, 200 free relay and 400 free relay. His 44.21 in the 100 free ranks him 10th in the NCAA standings. Though the Badgers couldn’t collect meet wins against California and Stanford, Martin captured four individual-event wins last weekend. 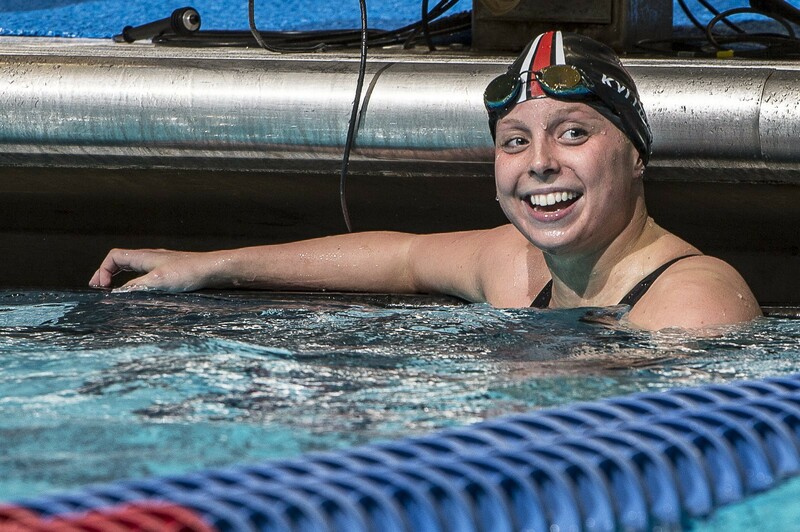 She won the 100 free in both meets with a fastest time of 49.13 over Missy Franklin in the Cal meet. She also won the 100 fly against Cal with a 53.93 and recorded a 22.32 to win the 50 free against Stanford. The freshman continues to impress on the springboards, winning the 3-meter competition against Western Kentucky with 461.33 points. He was also second on 1-meter with 374.33 points. The Chinese sophomore collected a win on the 1-meter with a 329.32 points against Florida and was third on 3-meter. White won the 200 IM (1:49.08) and 200 fly (1:49.19) in the dual meet against Penn State for his first college meet victories. His 200 IM puts him in the top 20 among collegiate swimmers so far this season. Ohio State and Rutgers share the Female Freshman of the Week accolades after Zhesi and Walkowiak impressed in separate dual meets. Zhesi won the 50 and 100 freestyles against Denison last weekend, with her 50 free time placing her in the top 10 in the collegiate standings. Walkowiak also won two events, sweeping the diving competition in the quad meet that saw Rutgers defeat Villanova, Georgetown and Seton Hall. Moore placed first in the 100 butterfly in the Highlanders’ meet against St. Peter’s and also re-broke the NJIT school record with a time of 52.89. Moore also won the 200 freestyle with a time of 51.55. Case led Campbell to a 174-85 win over visiting CCSA foe North Florida Saturday, winning the 200 butterfly and 100 freestyle, while anchoring wins in the 400 medley and 400 freestyle relays. Case topped the 200 fly with a 2:06.40, followed by the 100 free with a 53.80. Campbell took the top spot in both relays on the day, first the 400 medley relay anchored by Case with a time of 3:58.92. Again anchored by Case, the Camels closed the meet with the top time in the 400 freestyle relay, a 3:36.90. Case was one of three Camels to win at least two events in the Campbell victory. In the meet against St. Peter’s, Schmidt scored 195.38 points to win the 1-meter board and on the 3-meter, he won with a score of 170.79. Magill won the 1-meter diving event at the Keydets’ tri-meet against CCSA rival Howard and Loyola (Md. ), with a score of 226.50. She also finished second in the 3-meter dive. Lukens won two individual races and also swam a leg on two winning Drexel relay teams. He not only broke the pool record versus Binghamton in the 100 fly, but also did it in the 200, cruising with times of 49.52 and 1:51.14, respectively. The junior helped the Dragons set a new record in the 200 medley relay (1:32.06) with a first-place showing and followed that with another victory in the 400 free relay (3:07.74). Lukens’ new top time for the 200 fly is the best mark in the event for Drexel since 1989. Howard picks up her first weekly honor of 2014 after a solid weekend which saw the Tribe senior win three individual races over two meets. Howard competed well versus Duke on Friday; capturing second in the 100 fly (56.48). She also raced a rare 50 fly, outlasting the competition with a first-place finish in 25.03. Howard swam a leg for the Tribe’s 200 medley relay team that also earned first place in 1:44.22, which was good for a new pool and dual-meet record. Against Richmond one day later, Howard won both the 50 (23.47) and 100 free (51.89) and swam a leg for the winning 200 medley relay and 400 free relay teams. Sanchez remained undefeated this season on both the 1 and 3-meter boards, earning first-place finishes over the weekend. He scored 260.25 on the 1-meter and 295.28 on the 3-meter. Arceri wins her second weekly nod of the season. The junior helped the TU women remain unbeaten and move to 7-0 on the season after earning first-place on the 1-meter board (287.18) and third place on the 3-meter (270.68). Teammates Natalee Szopo (287.10) and Lyndsey Dickson (274.65) scored just above Arceri on the 3-meter. Henry was a key factor in the Eagles’ 153.5-144.5 victory over Oakland University, Nov. 8. Henry won two individual events, and also swam the third leg of the winning 400 free relay team that clinched the win in a down-to-the wire end race. Henry first won the 200 free in 1:38.83, a time that ranks atop the MAC standings for the 2014-15 season. He went on to win the 100 free in 45.97 seconds, good for the fifth-fastest time in the conference. Burns stayed perfect on the season by winning the 50 and 100 freestyle events against McMaster on Saturday. Burns won the 50 free in a time of 24.07. She won the 100 freestyle in a time of 52.28. Burns was also a part of a pair of relay victories, winning the 200 medley and 200 freestyle relays. Taylor had two solid meets at both Florida International and Miami as the Redbirds traveled to Florida over the weekend. Taylor won all three of her individual events on Saturday against Miami: the 100-yard breaststroke (1:05.10), the 200-yard breaststroke (2:20.98) and the 200-yard IM (2:08.79). Taylor’s 100-yard breaststroke time was a season best. At Florida International on Friday, Taylor finished second in the 100-yard breaststroke (1:05.50), the 200-yard breaststroke (2:20.73) and 400-yard IM (4:34.32). Walker was impressive against some of the top schools in the nation. The freshman continued to show her skills off and lead the SIU women’s team. In the 1000-yard freestyle (10:19.50), Walker earned a first place finish in the dual against Missouri. Walker also earned second place finishes against Kentucky, Missouri, and Northwestern in the 500-yard freestyle (4:55.93). Sherry Zhang once again showed why she is one of the top divers in the country this weekend, sweeping first place honors in the one- and three-meter dive against Kentucky, Missouri, and Northwestern. Zhang bested the field in the one-meter dive, earning a score of 337.40. Zhang followed that performance by taking first overall in the three-meter dive with a final score of 351.60. Zhang has now finished first in every event this season. Wenting Zhang had stellar performances on the road last weekend. On Friday, the All-American diver won both of her events against Florida International. Zhang scored a 340.20 in the 1-meter competition and a 368.92 in the 3-meter competition. On Saturday, Zhang finished second in the 3-meter competition with a score of 351.38, just .07 points shy of fellow All-American and Miami diver Cheyenne Cousineau’s first-place score of 351.45. The junior had a very diverse schedule in last weekend’s meet against UC-Davis, winning three individual events. 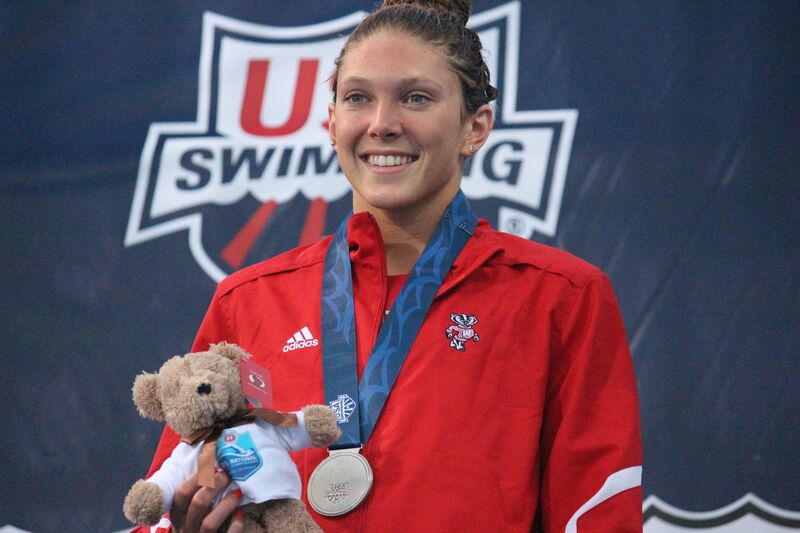 She posted a winning time of 10:08.10 in the 1000 free, 2:16.76 in the 200 breast and 2:04.71 in the 200 IM. Palmer won both springboard events in helping Nevada beat UC-Davis last weekend. Her scores of 350.25 on 1-meter and 375.90 on 3-meter are career bests and rank first in the Mountain West Conference. They also set UC-Davis pool records. The senior posted two wins and a second-place finish to help lead the Fighting Tigers to a pair of victories over Sarah Lawrence College and the College of Mount Saint Vincent this past Saturday. Worden took first place out of six swimmers in the 200-yard freestyle after touching the wall in 2:09.73, while also being a part of the four-man crew that took first place out of four teams in the 400-yard freestyle relay with a time of 4:07.87. Worden also took second place out of four swimmers in the 500-yard freestyle with a time of 5:48.58 during the double-dual meet. The freshman notched first-place finishes in all three individual events she competed in during a dual with NEAC foe Gallaudet University Saturday, which helped the Falcons defeat the Bison 102-92 and give them their meet win in program history. Hall took first place in the 50-yard freestyle with a time of 0:25.48, the 100-yard freestyle with a time of 1:02.12 and the 100-yard butterfly with a time of 1:03.94 to rack up 27 points in the milestone victory. Baurle swam to individual victories in the 100 (1:01.67) and 200 (2:17.04) breast in Saturday’s victory over Allegheny. He was also triumphant in the 400 medley relay (3:37.64), teaming up with Mitch Stahara, Steven Brooks and Brad Kolesar. Frollo won the 50 free (25.07) and 100 fly (1:02.50) in Friday’s victory over Mount Union, and also competed as a member of the winning 400 medley (4:13.33) and 200 free (1:41.93) relays. In Saturday’s quad at York, she earn wins in the 50 free (25.13) and 100 free (56.29) and swam on the winning 400 free (3:46.18) relay. Chadwick contributed to Mizzou’s dominant performance Nov. 7-8 when the Tigers earned three dual victories over Kentucky, Northwestern and Southern Illinois. 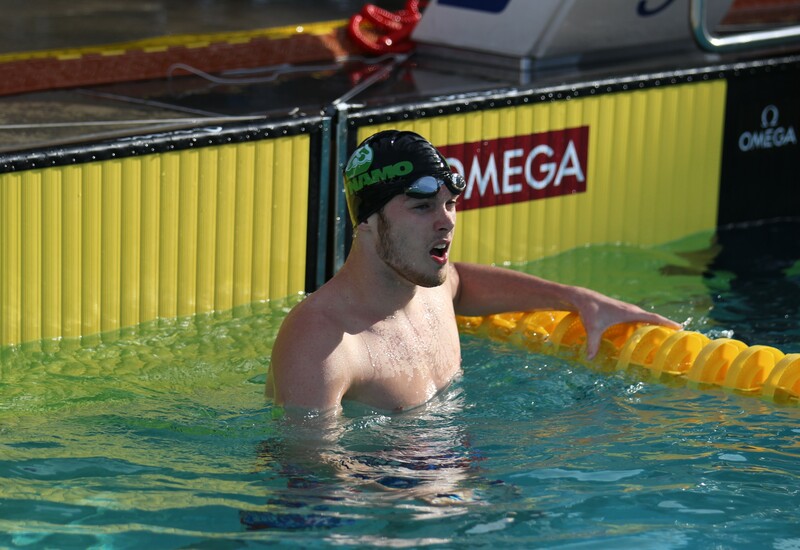 He finished first in both the 100 free (44.41) and the 200 free (1:38.70). Chadwick also helped Mizzou win the 400 medley relay (3:17.89) by anchoring his team with a 43.69 split. His 100 free time of 44.41 ranks 20th in the NCAA and he remains ranked 23nd nationally in the 200 free with a 1:38.26 against Missouri State. Chadwick now has five individual event wins through three meets in 2014-15. Ross helped Mizzou earn three dual victories Nov. 7-8 over Kentucky, Northwestern and Southern Illinois. She claimed first place in both the 200 IM (2:01.64) and the 100 breast (1:01.15) and aided the 400 medley and 200 medley relay teams that both grabbed wins. Ross added a second-place finish in the 200 breast (2:16.07). Her 200 IM time is the Tigers’ best in that event this season and ranks her 19th nationally. The sophomore’s 100 breast time also ranks her ninth in the NCAA and gives her an NCAA ‘B’ qualifying time. Ross already holds the school record in the event (59.56). In South Carolina’s victories over East Carolina and College of Charleston on Nov. 8, Miller took the top spot in both the 1-meter and 3-meter diving events. He scored a season-best 375.00 points in the 1-meter, and 390.35 points en route to his third straight win in the 3-meter. In South Carolina’s victories over East Carolina and College of Charleston on Nov. 8, Lamendola claimed her first win of the season on the 3-meter springboard, finishing with a personal best score of 354.35. She also took second place in the 1-meter with a season-high 315.35 points. In Georgia’s sweep of Georgia Tech and Savannah College of Art and Design on Nov. 7, Kalisz came in first in two individual events. 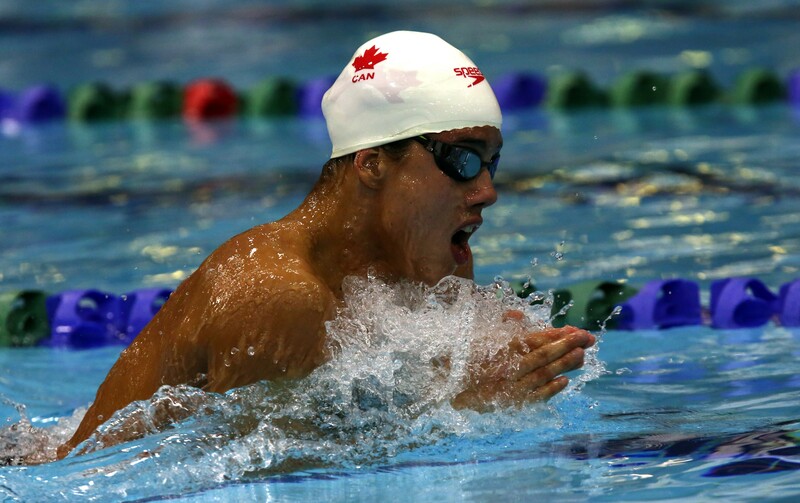 He won the 200 freestyle in 1:38.14 and the 100 butterfly in 48.83. Bentz also helped the 400 freestyle relay come in second in 3:03.86 as he led off in 45.73. The Bulldogs improved to 5-1 this season and have won 48 straight meets against Georgia Tech dating back to the 1961-62 campaign. Stevens recorded two individual event wins and contributed to Mizzou’s three dual victories over Kentucky, Northwestern and Southern Illinois on Nov. 7-8. She finished first in both the 100 back (54.97) and 200 back (1:57.17). She now boasts the 16th fastest time in the NCAA in the 200 back and the sixth-best time in school history through only four career collegiate meets. Additionally, Stevens was a part of both the 200 medley (1:42.33) and 400 medley (1:42.33) relay teams that secured first place. McLain collects his second career Swimmer of the Week award after sweeping the backstroke events to help South Dakota State defeat league rival South Dakota, 189-111. He touched the wall first in the 100 back in 52.00 and 1:55.97 in the 200 back. Both of his times rank in the league’s top-10 this season at fifth in the 100 and ninth in the 200. He was also a member of the winning 400 medley relay team (3:27.88). Schutt earns Swimmer of the Week honors for the fourth time of her career and third time this season after winning every individual event she competed in a pair of meets. In the 165.5-134.5 victory over league foe Omaha, she took first in the 100-meter free (58.77), 200-meter free (2:07.44) and 400-meter free (4:29.95). The sophomore came right back to capture three more event titles at South Dakota State, winning the 100 free (52.89), 200 free (1:54.09) and 500 free (5:09.10). Florand claims his third career Diver of the Week award and first of the season after sweeping the diving events en route to South Dakota State’s 189-111 victory over league rival South Dakota. The senior won the three-meter dive with an NCAA Zone qualifying score of 328.43, while finishing first in the one-meter with 271.88 points. Florand’s score in the three-meter ranks third in the league. Herrting garners her 14th career Diver of the Week award and fourth of the season after sweeping both boards in a pair of duals meets against league opponents Omaha and South Dakota State. Against the instate rival Jackrabbits, the Appleton, Wis., native won the one-meter dive with a league-best and NCAA qualifying score of 278.40, while recording 266.03 points for first in the three-meter. In the Coyotes’ 165.5-134.5 dual win over the Mavericks, she tallied 249.90 points in the one-meter dive and 265.95 points in the three-meter, both for first-place finishes. Some information in this article was taken from press releases.